Ooty is a famous hill station of India which is located in the Nilgiri in the state of Tamil Nadu. This popular hill station attracts many tourists from all over the world every year and to cater to the need of the tourists, it has many hotels. There are numerous hotels in Ooty to serve its tourists with and one such being is Sagar Holiday resort Ooty. It is one of the popular hotels of Ooty which is located in the beautiful hills of Ooty. 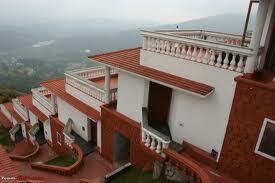 Sagar holiday resort Ooty is spread over 2 acres of lush green mountain slope. This resort is known to offer personalized services with high class services to its guest to make their stay in Ooty comfortable and memorable. It offers great views and warm hospitality, modern comforts at great rates. The resort includes 36 well furnished cottages and each of the cottages has a living room, open terrace and slightly elevated bedroom to offer you the great view of sunrise every morning. Amenities offered at Sagar Holiday Resort include secretarial services, home theatre, library, laundry, restaurant, terrace garden, elevators, lounge and many more. The restaurant at this hotel serve three course meals prepared from the best and local and home grown produce.